Alaska Native Is First Yup'ik Musher To Win The Iditarod Kaiser is the first musher of Yup'ik descent to win the Iditarod sled dog race. His win is a significant point of pride for Alaska's indigenous people. Peter Kaiser and his team of dogs take off at the start of the Iditarod race. 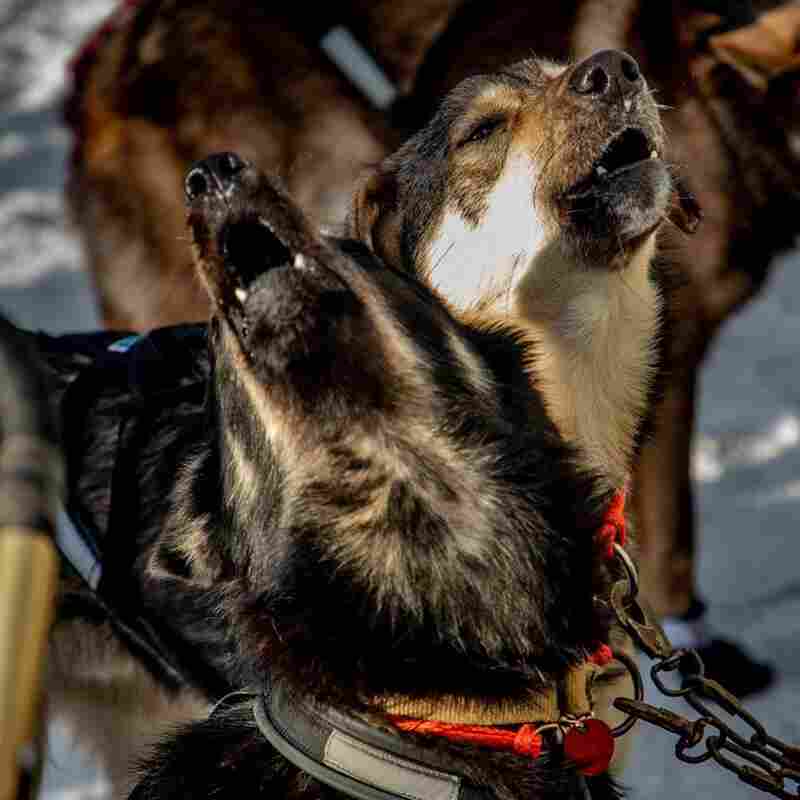 Snow whipped past Peter Kaiser and his eight-dog team as they passed under the famous Burled Arch at the end of the grueling, 1,000-mile Iditarod sled dog race, cinching a first place win. 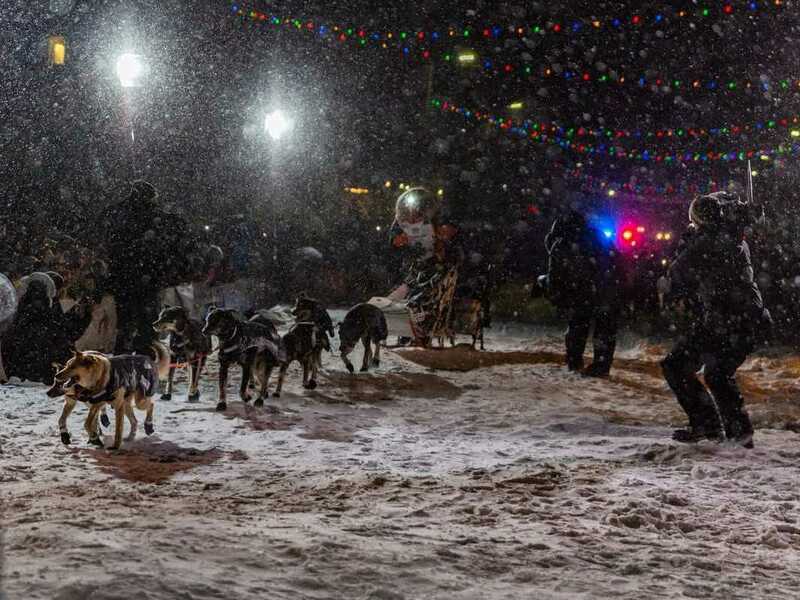 After racing for miles in inky darkness across the Alaska wildnerness, Kaiser was greeted in Nome, Alaska by bright lights, cameras, and cheering fans chanting "Way to go Pete!" It was the 31-year-old's tenth time competing in the Iditarod, but his first time winning the championship — making him the first musher of Yup'ik descent to ever win the race. Just after his finish at 3:39 a.m. on Wednesday morning, Kaiser raised both arms in a double-fist pump celebration. 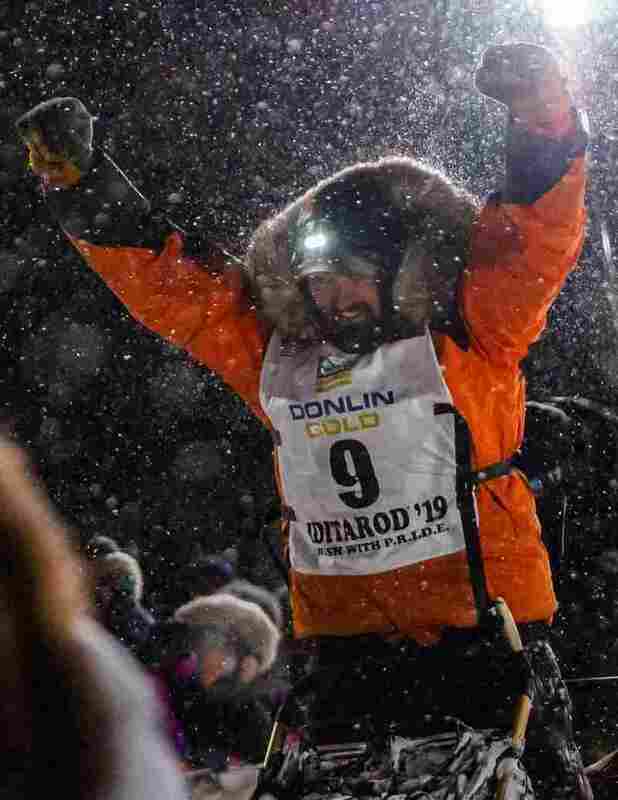 Peter Kaiser celebrates his first-place victory at the finish line of the Iditarod race. "Honestly, I've heard this from many different people that have won, but it hasn't sunk in," he told NPR's Melissa Block. "Like, you actually have to think about it pretty hard and you're like, 'oh man, I actually won this.'" Kaiser managed to edge out the defending champion, Joar Leifseth Ulsom, by 12 minutes. His winning time was nine days, 12 hours, 39 minutes and six seconds. "We just got some trail that the team really likes and we didn't see much of that this race," Kaiser told Alaska Public Media. "My team really likes hard, fast trails where they can go fast, and that was probably the best type of trail for that kind of race, so when they got on that they really wanted to roar." His win is a point of pride for his hometown of Bethel, Alaska which is situated in the Yukon Delta. The delta is where the Yukon and Kuskokwim rivers empty into the Bering Sea on the western end of the state — and is the traditional land of Yup'ik people. "It's about time somebody wins from Kuskokwim," Bethel resident Nelson Alexie told KYUK's Anna Rose MacArthur. Over the course of the race, Kaiser's supporters — many of whom were from the same area as him — cheered him on and followed his race through his website and Facebook page. One native, Evon Waska, spoke in the Yup'ik language about the significance of the win for Alaskan natives. "We Yup'ik people, are very proud," he told KYUK. Unlike other competitors, who hail from prominent mushing families, Kaiser doesn't come from a dynasty of champion mushers. "We kind of have our own little mushing story but it's not quite as mainstream as some of the others," Kaiser said. Though Kaiser is Alaskan on his mother's side, it was his father, Ron Kaiser, originally from Kansas, who introduced him to mushing. His father had a dog team and started mushing in the late 70s — but never competed at a high level. At first, Kaiser mushed for fun, but after graduating high school and trying out college, he decided he wanted to make a career out of racing. In the winters, he trains and races, and in the summer he works seasonal jobs. He owns a total of 40 dogs at his kennel, which require attention, care and training all year round. Of Kaiser's eight-dog team — Morrow, Lucy, Frieda, Sky, Zuma, Pronto, Charlie and Arbor — Morrow and Lucy were his two lead dogs that pushed the team across the finish. Kaiser said he thinks the dogs know they accomplished something special. "They have an idea of when teams are in front of them on the trail or not," he said. "They're real spunky right now and probably ready to go for another run, but they're going to get some good time off." In the past, his best finishes had been a fifth place spot in the 2018, 2016 and 2012 races. His prize for winning this year's race includes $50,000 and a new truck. He is also planning to take some time to enjoy himself. His secret for success this year? He's not quite sure — he said there are a variety of factors that may have helped him triumph. "I can't put my finger on one thing in particular, but I guess we have a whole year to kind of figure out what we did right." Kaiser regularly pays attention to the small details that contribute to a win. He jots down extremely precise details about his dogs and various races in many notebooks that he regularly studies to enhance his performance. One big factor is the snow itself. The record for the fastest winning time in the Iditarod is a time of eight days, three hours, 40 minutes and 13 seconds by Mitch Seavey in 2o17. By comparison, this year's race was a little slow — partially due to how the warmer weather over the past two years has impacted the snow. "Anytime you get fresh snow and drifting snow and warmer temperatures, you're going to have a slower race," Kaiser explained. "So the pace of the race is really more dictated by trail conditions and weather than dog teams." 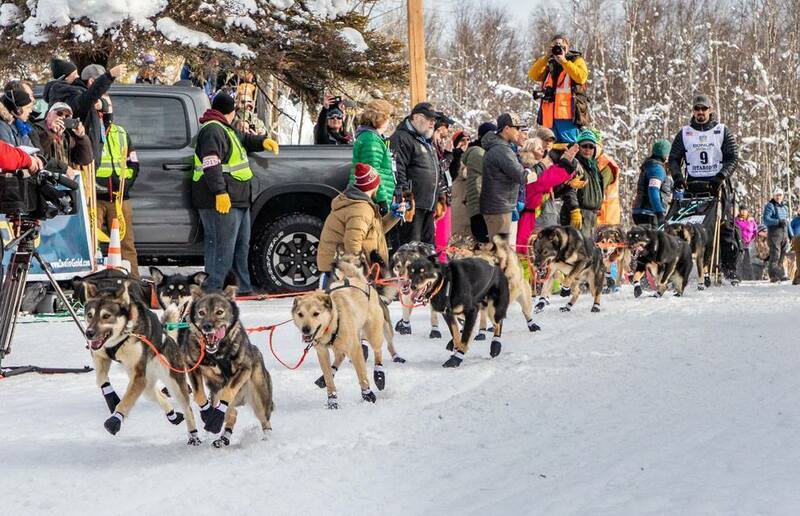 Peter Kaiser and his team of dogs crossed the finish line just past 3 a.m. on Wednesday morning. It's too soon to tell whether Kaiser is kicking off an Iditarod dynasty for his six-year old son and 1-year-old daughter. But, his son Ari took to the dogs from an early age — making puppy-like howling sounds — and likes to mush with the family's retired racing dogs. Since his son only weighs about 45 pounds, his sled team is a lot smaller than Kaiser's — it's comprised of one dog, instead of eight. About a week before Kaiser left to race the Iditarod, his son went on a dog sledding exursion of his own — bringing his baby sister, Aylee, along for the ride.